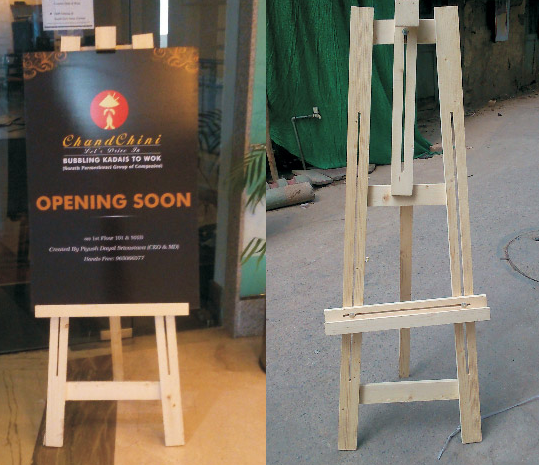 We offer easel stand with and without sunboard banner with free delivery in India via Fedex. Sunboard for easel stand is 3mm thick printed on high quality laminated eco solvent vinyl for best output. Wooden easel stand is an eye catchy display for your banner. These can be used for both indoor & outdoor displays. If you have been to Ambience Mall, Gurgaon or any other high end mall or outlets in Metros or upcoming town and cities in India, you can hardly pass by without finding one. After complete swept over by standees in digital media space, there is refreshing resurgence of back to normal sturdy displays. These are light weight to carry at the same time highly robust to fight against extreme weather & wind conditions. It make them excellent choice for brand owners as they can spend time on sales instead of looking after stand. In month of January 2017, we spoke to Ms. Khushboo Sharma who is expert in Outdoor media & displays items and currently associated as consultant brand manager with reputed companies. She sees an immense potential in this product thanks to its look and appeal, their life span is good, though costly with sunboard yet they have potential to be leader in its marketing space. There is no general thumb rule for size, you can adjust is as per the usage location & creative brief. Easel stand is more sturdier than roll up standees. Easel stand is made of wood whereas roll up standee is of aluminium. Easel stand sizes is fairly adjustable whereas roll up standee size is fixed. We can only vary size of pop up standee by reducing the size of the rod which hold to standee. These standees comes in standard sizes of 2x5 ft, 3x6 ft, 2.5x6 ft etc. Easel stand along with sunboard stand turns out to be little more expensive than roll up. But as sunboard is a thick board with digital print, so comparing it rates with digital non terrable standee there is hardly any difference. We can not use ordinary flex or star flex for easel stands. As we require thick surface to be placed on to these stands, we require material like sunboard, foam board, sunpack sheets, writing board etc. As flex and star flex is used for hanging they can not be pasted on to the sunboard or any plain surface. So digitally printed sunboard with digital vinyl is what is used for these sunboards. You can also purchase blank easel stand from us and use it as writing board as well. Do you print promo table in any other material apart from sunboard? We print and recommend only high quality sunboard. You can also go with other cheaper alternative like flex mounted on MS frame or wooden frame. 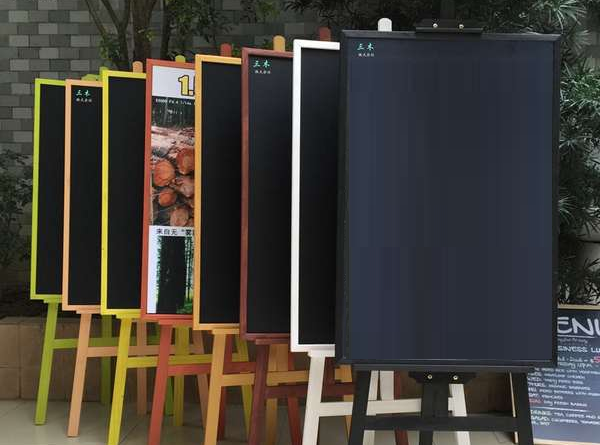 If you are looking for printing more than 5 easel stand for your company then we can offer you great discounts, to know more, kindly feel free to contact us. If I place order for two designs 1 each then will I have to pay rates for 2 easel stand? These will be blank easel stand without any printed banner. There will be no sunboard only easel stand will be delivered. Body color of easel stand will be wooden color. Currently we are not offering painted easel stand. Printed on 3mm sunboard with high quality eco solvent print with gloss/matt lamination.